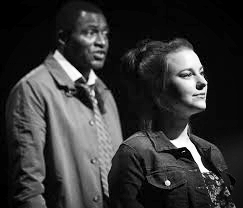 "Jon Tracy's propulsively paced production puts O'Rowe's thick onslaughts of description and hairpin-turn plot developments in the hands of such highly skilled actors as Stacy Ross, Marissa Keltie and Carl Lumbly." "Tracy, who also directed last season’s unforgettable “Any Given Day,” fills each moment with a palpable sense of urgency and clarity that’s quite thrilling." "There is no doubt that this will stand as one of the most astounding productions of the season."